All Mustangs were not created equally. Some were blessed with V-8s while others were content to be powered by only 6 cylinders. This is one of the later. In 1967, Mustang had its first real competition. While the Plymouth Barracuda was previously a minor contender, it was restyled in 1967 with three models plus the Chevrolet Camaro, Pontiac Firebird, and Mercury Cougar had arrived. Even with the competition, Mustang still sold over 472,000 cars in 1967. This is a 1967 Ford Mustang 2 door hardtop for sale here on Craigslist in Jarrell, Texas. 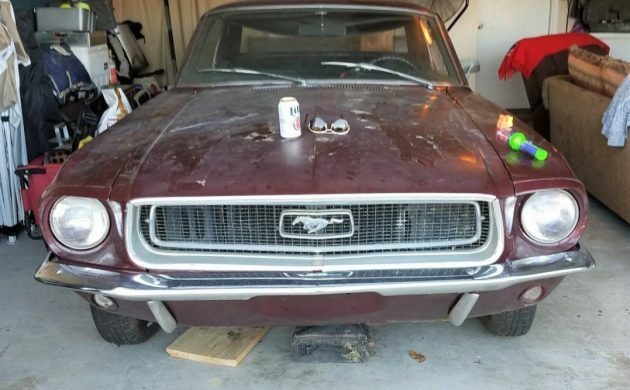 This Mustang was apparently in an accident way back when, but the seller does not disclose what the damage is or show a picture of the damage. Until that time it had been driven only 28,000 miles and was parked. The car even has its original tires. I’m wondering how that happened though because bias ply tires normally didn’t last that long if my memory serves me correctly. Inside we find an interior in good condition except that the headliner is ripped and falling down. 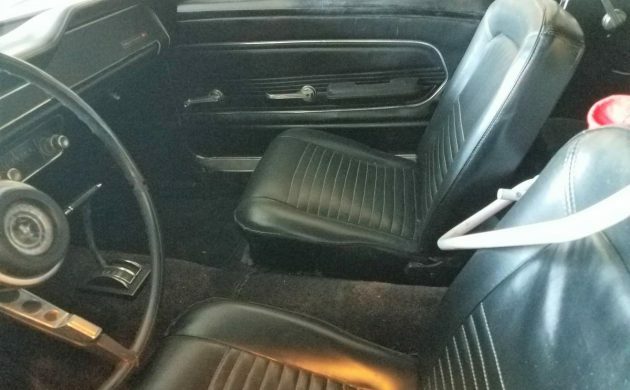 The black vinyl bucket seats are in great condition and the dash has no cracks. This car has a SelectShift Cruise-O-Matic transmission. It also appears to possibly have the optional Tilt-Away steering wheel that moves aside when the door is open and tilted up and down to nine driving positions. 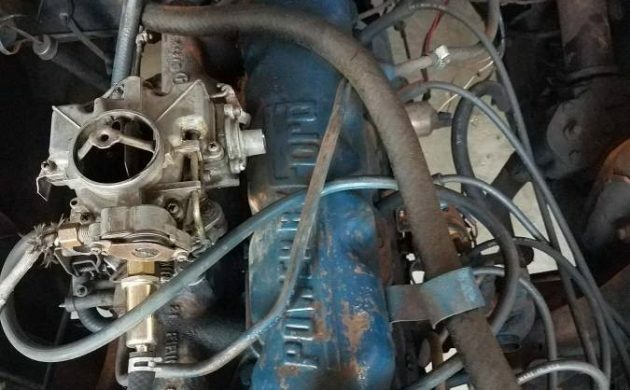 The engine powering this Mustang is a 200 cubic inch six that produced 120 horsepower. The seller drives the car some on the interstate at 65 mph, and it runs fine. There is about $400 in repairs needed to the seat belts, horn, and parking cable. There is no title, but depending on your state’s conditions for titling a vehicle this age, that may not be an issue. The seller is asking $6,500 for this low mileage Mustang that will only need a few things to make it road ready. Are you a big fan of the 1967 and 1968 Mustang? I’m a fan of the Mustangs bt not this one. It’s a no on many levels. the first generation plymouth with a slant 6 was a100 times better than this gutless wonder! anybody thats ever tried to v8 in a 6 cylinder mustang has wished he had taken up getting drunk! you got to change every thing , brakes, springs rear end, and more and they were rolling rust buckets! local auto wreckers crushed 100s of them! Guy leaves a beer can on the hood, but couldn’t show pics of the rear or the undersides. Didn’t elaborate on what the collision damage or show pics of it. Stroller in back seat lets you get a good look at said seat. Not helping himself. He didn’t leave a “beer” can on the hood. That stuff definitely does NOT even remotely resemble beer. I agree now if it was A LONE STAR you would have a GREAT CAN OF SUDDS!! I was raised on Lone Star and I am 69 and going strong!! I just don’t get it. Is it laziness or ignorance or both? Why would one not clean the car inside and out, move it out for pictures and present it in the best way possible to get the most attention and the most money for it? Just amazing to see this happen time after time. Maybe, as someone mentioned on here previously, they really don’t want to sell and are doing it to please their partner…”See dear? It didn’t sell”. lol. Peeling clear coat on the hood and obvious radial tires highlights that the sellers claim of 28,000 original miles is pure fantasy. For the asking price the seller needs have the paperwork in his name, that alone is reason enough to pass on this car. @Steve R. The write-up states that it is still running on it’s original Bias Ply tyres. IIRC, the original paint on these cars was single stage. Not basecoat/clearcoat. 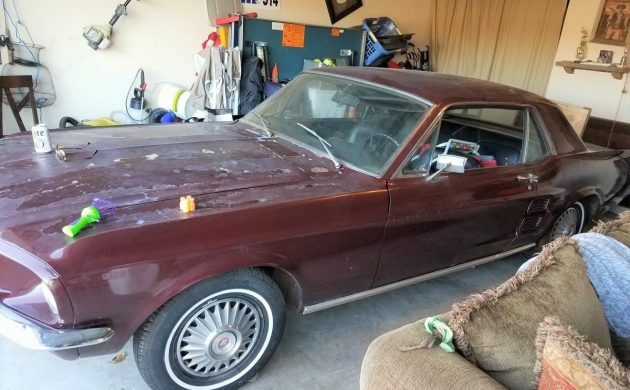 So, let me get this straight…no title, claims original 28k miles, he bought it from a guy who bought it from a guy at auction, he drives it on the interstate at 65 MPH on the original tires, and he wants $6,500.00 for it? Who else split a gut laughing at this ad? I’ve seen worse for more! Tires are clearly late model radials, and clearly not original. Do you guys even look at the pics when you write these up? I bet tires are under 10 years old. This is a recent tread and sidewall design. The original tires COULD be on it if it really had 28k miles, but maybe it doesn’t? Is there a national database of stolen collector cars that one can access to find out if a car is hot? I agree with everyone’s suspicions about this one. This car would have had a lacquer paint job originally wouldn’t it? Peeling clear coat also tells me this one has been out in the sun a lot post cheap paint job #2, and photographing it in the garage under a layer of dust with crap sitting on it does not say garage kept to me. More like rolled in there and turn the vacuum cleaner on reverse like Lilly Munster to blow crap all over it. Not to mention the BS about the tires. I have friends with collector cars with bias ply tires on them and they look totally different than radials. I wonder if the car got repainted after the accident damage and they made it into a bondo bus? Too many questions and no straight answers here.